The instruments students make in my program range from simple bottle shakers and PVC drone horns to the assemble-them-yourself electric guitars seen here. 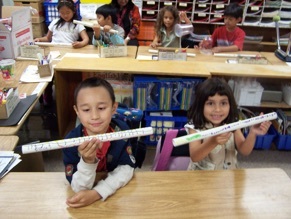 In Third Grade, for example, students begin composing for the recorder, even as they learn their first three notes -- B, A, and G. Recorder is a challenging instrument, and kids quickly lose interest in practice exercises. I find letting them be creative keeps them more engaged. I use a tablature style of notation, that shows how to play as well as what note. Conventional note reading comes later. In 4th and 5th grade I use an activity called Rainbow Rhythm Puzzle Box. 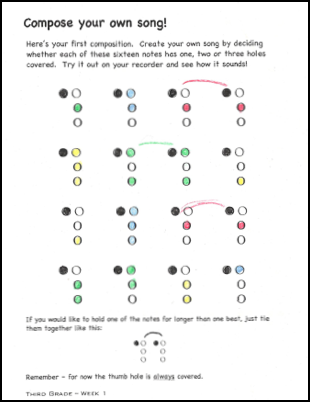 Kids color in puzzle pieces with half note, quarter note and eighth note values and then assemble them to create a 2 measure (8 beat) rhythmic ostinato. 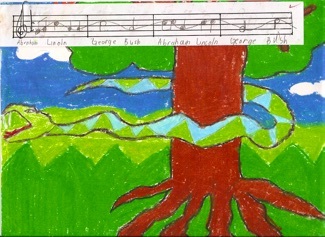 In both grade levels this is the first step in developing an original composition. 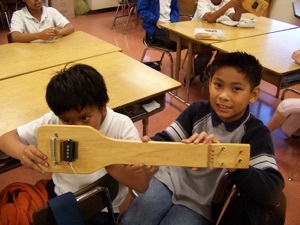 When I began teaching, using homemade instruments was a cost-effective way to give every student an instrumental music experience. Thanks to the generosity of Third Street and Wonderland parents, both my schools own a wonderful set of Orff barred-instruments, called an instrumentarium, as well as a variety of world percussion instruments. But I still use instrument-making as a teaching tool because it gives students an individualized music experience they are deeply connected to. 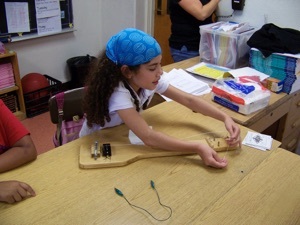 It also gives me a chance to teach certain concepts -- for example, the properties of electromagnetism that are a fourth grade California science standard and also fundamental to how electric guitar pick-ups work. In some music programs performance is the primary goal, but I find putting an emphasis on shows tends to make me concentrate on what is entertaining instead of what is being learned, and to focus on the skills of a few kids with outstanding ability instead of everybody. Because of this, I generally try to emphasize process over product. Nevertheless, performances are an important part of my program at both Third Street and Wonderland because sharing your work with the community is an important part of the music experience. Here’s a short piece from a 2nd grade sharing at Third Street. The kids are performing “The Break” -- a body percussion piece by Doug Goodkin that utilizes a wonderful system devised by Keith Terry. (Note the gourd drums at their feet -- to be used in a drum circle later in the show). One of the things I try to do is encourage students to collaborate among grade levels and student groups. For this performance from this year’s Wonderland Renaissance Faire, the 3rd graders contributed choreography, the Recorder Ensemble made up of 3rd, 4th and 5th graders contributed the accompaniment..and everybody sang! Some of my favorite performances are the ones that occur in the classroom as culminating activities, as in this piece where first graders adapted one of the stories they were reading as a grade level using music and movement. The six segments were developed by each class separately and then combined for the first time on the final day of class. 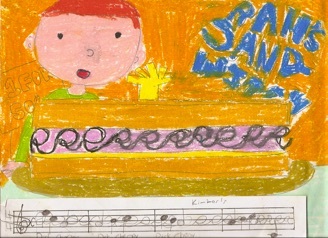 Student composition is an essential element of Orff and my own teaching philosophy. Most of the musical self-expression that occurs in class is of the moment. Sometimes, however, I have the kids notate their compositional ideas. Melodic contour is a concept I cover in 4th grade. Having focused on mathematically precise units of rhythm, it is sometimes challenging for students to get their heads around the relativity of rising and falling pitch in a melody. To help them, I begin to talk about melody by focusing on how the melodic line is the same as a line of contour in visual arts. 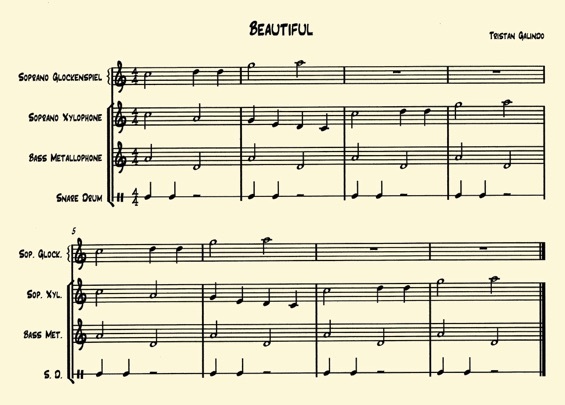 They create a contour line which is used as a basis for both a drawing and a 4-bar melodic phrase. Third Street 4th grade teacher John Bassett helped develop this lesson. Of course, there are also more traditional performance components, such as preparing 5th graders to sing at culmination. 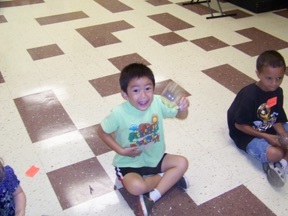 Here the primary instructional goal is simply to help them make a joyful noise.